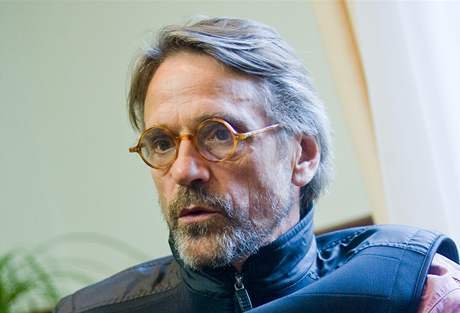 In June 2009, Jeremy Irons was in Czechoslovakia to attend the Art Film Ffest in Trencianske Teplice and to accept the Actor’s Mission Award. “People prefer their dark side hidden,” says British actor Jeremy Irons. But apparently his work has always enjoyed the most. In late June he came to Slovakia and the Art Film Fest in Trenčianske Teplice took the actor prize mission. Charismatic British actor Jeremy Irons made his debut in 1980 in the film Russian ballet dancer Nijinsky. The film combines, in which he starred with Robert De Niro, his six years later earned a Golden Globe nomination. Yet appeared last year in continuation of the Pink Panther. In London the Duke of Yorks Theatre, you played the game of Christopher Hampton and passion based on the novel written by Sándor Márai. Did you know that Marai was born in Slovakia? But died in America. You probably would not return before you will be democracy, right? It’s a beautiful book. I read it several years before I performed in that game. The character should be played by older players, but has so many monologues, that they would probably have problems. Marai wrote this novel, that every great passion is hopeless, otherwise it was just a barter lukewarm interest. Some truth to it will be. People looking for an impossible dream. It is very hard to maintain passion when it is permitted. Often you receive characters deceivers, but also gay. It’s more coincidence. As an actor, doing characters that we offer.
. Have performed even mysterious, to the horror genre. Do you own the dark side? We all have sites that are trying to hide from others. Now you as an actor but I always attract, positive characters interest me. Still, I believe that movies, where I worked, the results are positive. I try to live fully, to explore the lives of most. When you’re in the movie Mission climbed a waterfall, it looked rather dangerous. It was so in reality? I think it was, even though the corner waiting for rock climbers, who would catch me when I slipped. As an actor and director, I love looking for a job that attracts me and tested. The biopic of American painter Georgia O’Keeffe play her husband, photographer Alfred Stieglitz. He allegedly said that a photograph is not art and that artists can be a shoemaker. It is not, as even the image is automatically art. Umělecké dílo musí komunikovat. Artwork must communicate. They are painters and artists. Indeed, most collectors of contemporary art is more about investing. And the film is still business. Sure. I do not know if I ever make a movie that is a work of art. Can be an art book, or music? I’m not sure. You play the harmonica and the violin, what music means to you? I think it has magical powers. I recently saw Leonard Cohen. Created an atmosphere at the concert, which hardly reach any other way. Music will touch you, reminding you to some long-forgotten feeling. How do you work with your voice? Not realize it, it’s just a sound, which I try to speak. If you want to reproduce the feeling of acting, you have to concentrate on ideas, not to vote. Good players are trying to get into the heads of Mozart. Bad players play only the notes. Often you occupy the roles of people from high society. Yet I am not an aristocrat, I am middle class like you, I was tall and good to me sits dress. That is all. How did you get to work on the film Power of the Powerless, which tells the story of the Velvet Revolution in Czechoslovakia? Often they want me to record comments on the various documents. I worked briefly in Prague, I have several Czech friends who had emigrated after 1968, but with Czech dissidents was. He called me from a purely professional reasons and I took it like that. I think this movie is well done and that it seeks to address the issue honestly. British perceptions of Central Europe still a bit Kafkaesque? I like that I do not see Europe, but the tourism industry is to many Eastern European countries similarly open. Behind the Iron Curtain, we saw only a black space where there is poverty and where they do not travel. When I was filming in Romania, I saw the beautiful buildings that remained there from the 19th století. century. Although today most of them devastated, I believe that there once life returns. It seems that nobody wants Tibet to do anything. All Western countries want to trade with China. And the Chinese do the same thing, what did the Russians – they make about their country’s security buffers. You have also donated money to the charity that promotes yoga in prison. Why? No, but I have meditated for many years. What do you mean admiration by women? Even at a festival in Teplice Trenčianske you gave a lot of signatures. This signing was a little bored, but I’m flattered. I think people are not interested either way I do, but rather my characters, which are to be aligned. If I went somewhere and nobody would have cared about me, it would mean that I’m doing my job well. Sometimes call the former partners or film, how to? I do not do it often, but when I was in New York, I met with Meryl Streep and Glenn Close. When I was last in Italy, we have seen with Ornela Mutti, France is trying to find Fanny Ardant and Juliette Binoche. They’re just a professional relationship? No, it is often the friendship.